According to new research by Fruyo, us Brits are the unhealthiest snackers in Europe, with 41% of us admitting to snacking on crisps, chocolate and cookies. The survey also found that only 15% of us top up on healthy snacks, like fruit, vegetables or low-fat yoghurt - the lowest amount of all the countries surveyed. Chocolate in itself, isn’t really a big problem. It’s all the milk, sugar, oils and other additives that are added to our chocolate bars that up the calories. So either try nibbling on dark chocolate, or - better still - cacao nibs. Cacao nibs are basically chocolate in its unprocessed form. They’re the cocoa beans chipped into little chunks that you can use in baking, smoothies or just snack on them straight from the bag. They might taste a little bitter if you're not used to it, but they do have a host of health benefits. Cacao nibs are a good source of magnesium, fibre and iron and cause our brains to release endorphins, making us feel good too. Crisps are fairly empty of nutrients, having been deep-fried (or baked) and then dusted with flavourings. When you crave crisps, you could be craving salt or just the crunch. And nibbling on a handful of nuts will satisfy both. Obviously unsalted nuts are the better choice, but try some lightly salted almonds. They’re rich in vitamin E, which is good for your skin and high in fibre. Fancy some popcorn? Make your own. Instead of buying those folded up bags of microwave popcorn, make your own out of pure, unprocessed maize. It’s much cheaper - half the price, in fact - and you’ll know exactly what’s going into it. Pop the corn in a lidded saucepan with a little vegetable oil, shaking the pan over a medium heat until the maize has all popped. Just sprinkle with a little salt (try smoked sea salt if you can find it) before serving, or eat it plain if you prefer. 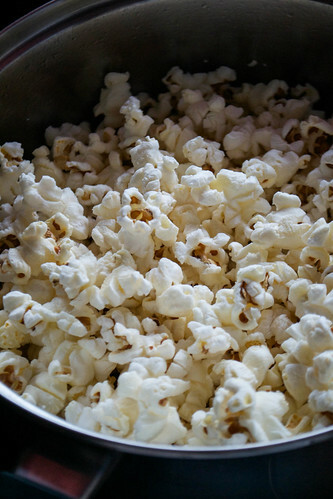 Have a look at my post on how to make popcorn and what to do with it afterwards. Biscuits are all fine and good, but are generally low in nutrients and can be high in calories. And it’s often really difficult to stop at just one. For a lower calorie alternative, keep a few rice cakes in the cupboard. They can be bought in sweet flavours as well as savoury and could satisfy the craving for a nibble between lunch and dinner. If you’re after that sweet, tropical flavour then why not ditch the sweets and get it straight from the fruit itself. Chop up a melon into chunks or grab a few grapes from the fridge to satisfy that craving for sweetness, without any of the added sugar, flavourings or colourings. Fruits are rich in antioxidants and are also a good source of fibre and water. Dried fruits can also be a good option but are higher in sugar because they're more concentrated - stick to a small handful. Ice cream is decadent and luxurious, but should really be eaten as a treat. If you’re munching on ice creams from the freezer between meals then why not try a spoonful or two of yoghurt instead? Opt for a good quality, thick, natural yoghurt which will give you the feel of a chilled and creamy ice cream - without all the calories. Swirl in a little honey or maple syrup for sweetness. Do you enjoy any healthy snacks throughout the day? What are your tips for healthier snacking and curbing cravings?